Quick Take: The Big Bang Theory, "The Benefactor Factor"
Review: The Big Bang Theory, "The Benefactor Factor"
(S0515) The head of the college wants the boys to attend a fundraiser party and explain to the donors exactly what they're doing so they can earn the money to get the tools they need. Sheldon decides that he has better things to do, Raj is scared (surprise! 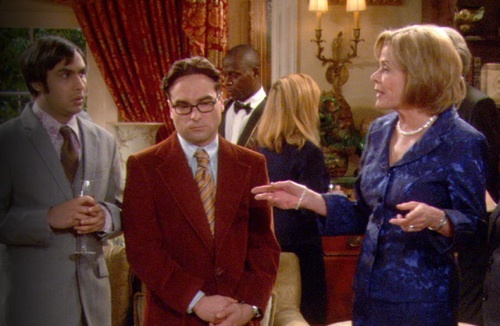 ), Howard gets no respect, but Leonard somehow makes an impression on Mrs. Latham, who takes a liking to him. She says she'll give him the money, but she wants him to sleep with her. There's the usual debate over whether he should or not, and in the end, he does -- because he likes her. It's nice for Leonard to get the spotlight for this episode, and it'll be intersting if this relationship with Mrs. Latham becomes a part of the season's arc -- May-December relationships are always interesting, and a comedy has more leeway about how they can handle it. Plus, Leonard being in a new relationship could force Penny to admit that she still has feelings for him. Plus plus, Mrs. Latham is fun. Self-posessed wise-crackers are always fun additions to a show. This was a sweet low-key episode. No one acted overly much over the top, and the heart of the episode is that Leonard is sort of a big softie, which is usually used as a way to pick on him, but in this one is used as a real character trait. He does what he needs to do for his department, but he does it because he's a nice guy and he actually starts to like her -- and, really, she would have given him the money anyway. These one-on-one sort of episodes, I think, are what keep the show focused on what it is, and remind us (and maybe the writers) who the characters actually are and where they hold their values. So Amy Farrah Fowler is technically engaged to a Saudi oil magnate. They should bring this up more often, and work it into her actual storylines. Not all the time, but it's rife with comedic potential! And Raj is really rich in India. They sort of skated over it, but that's a nice in for poking fun at the whole immigrant experience, and maybe for giving him something to do other than being afraid of girls. The scene at the end with the Walk of Shame was not flattering to Penny. Someone should have checked her light better! Video: The Big Bang Theory, "The Benefactor Factor"